In prior Coastal View columns I introduced you to two invasive species: giant Asian tiger shrimp and giant African snails, both large in comparison to their American cousins and threatening to ecosystems in the United States. 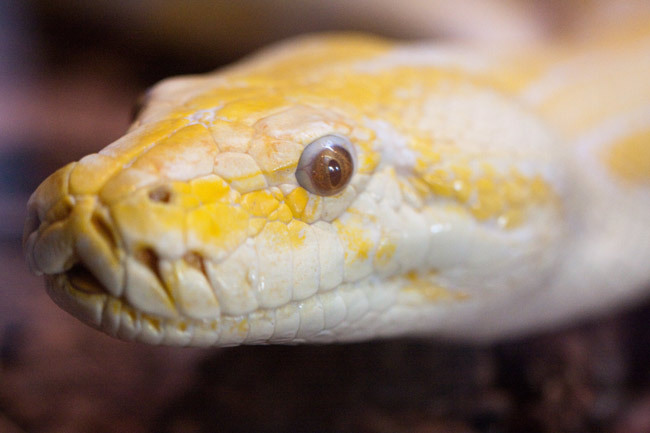 Today, we’ll look at another invasive creature, and this one is really a giant – the Burmese python. This particular invader is one of the largest in the world. Able to grow to 20 feet and up to 200 pounds, the Burmese python is a true giant that feeds on animals as large as deer and alligators. Introduced to the Florida Everglades National Park about twenty years ago, scientists and park rangers believe it has become a major threat to wildlife there, with an entire ecosystem at risk. And, of a lesser threat so far, yet no less invasive, is the presence of two other large snakes: boa constrictors and African rock pythons. Let’s back up and look at how the Burmese python came to be in the Everglades. Exotic animals are a big business in the United States, with annual estimates at $15 billion or greater. Exotic animals, often called exotic “pets” in the animal import business, are generally considered to be any animal not native to an area, such as the United States, that is introduced to that area by individuals who have imported them or bought them from a dealer in the United States. Exotic animals often are primates, cats, birds, fish and reptiles, most of which come from Asia, Africa and South America. Federal, state, and local laws provide various levels of regulation of the exotic animal industry, but there is no organized approach to regulation. According to the U.S. Fish and Wildlife Service (FWS), the illegal trade in wildlife is second only to that of drugs in the United States. However, unlike drug trafficking, animal smuggling appears to compel little enforcement and is free from stigma. This link details the current Florida regulations affecting exotic animals. Under this legal framework, exotic animals purchased as pets become too large or costly for their owners to maintain, and are sometimes released into South Florida’s rivers, woods, brush or swamp. Most exotic pets which have become troublesome to keep are not purchased by pet dealers and are not likely to be taken in by reputable zoos. With very few animal rescue facilities having the ability to care for exotics, owners simply give up and abandon their pets. This is not good for the animal, which has been removed from its natural environment and knows little of survival in the wild, or the human population, which has to contend with the animals’ unexpected presence, even in urban areas. Add to the equation that many species carry dangerous bacteria from foreign lands, and you have a serious threat to native species and humans. For example, an estimated 90 percent of all reptiles carry and shed salmonella in their feces. The Centers for Disease Control (CDC) estimates that 93,000 salmonella cases reported each year in the United States are caused by human exposure to reptiles. So, how did the Burmese python get into the Everglades? Maybe, as Andrew Wyatt, president of the United States Association of Reptile Keepers, believes, it was Hurricane Andrew in 1992, which destroyed a snake importer’s warehouse and allowed over 1,000 snakes to escape. Some wildlife experts believe snake owners who bought small baby reptiles found they could not deal with them once they became too large or too expensive to keep, and released them. We may never know the snakes’ origin, but what is certain is that South Florida, and especially the 1.5 million acres of the Everglades, now is home to thousands of Burmese pythons. Population estimates vary widely, from a few thousand up to 150,000 pythons nesting, breeding, and feeding in the Everglades, all with no known natural predator. With the snakes’ ability to have up to 100 eggs, and the absence of natural predators, the number could rise. Burmese pythons also pose a potential threat to protected species, such as the American alligator and the Key Largo wood rat. Until scientists discovered that the wood rat was declining rapidly on Key Largo through python predation, they had not considered that the python would swim across the saltwater Florida Bay from the Everglades. Subsequently, research has shown that the pythons often swim in fresh, brackish or salt water to save energy that would be expended in crawling from place to place. This opened a whole new threat to a wider area – the Florida Keys. While there is almost total agreement that preventing an invasion is easier than stopping its spread, a look at what is being done to curb the pythons illustrates the difficulty of the task. In 2009, Florida established a python hunting program which allowed residents to obtain a special license to hunt the reptiles. To date, with fewer than 100 snakes removed, this program has been far less than successful. Other attempts have included baited traps, a “Python Patrol” of trained humans in the Keys, and one interesting test whereby detection dogs from Auburn University’s Canine Detection Research Institute were trained to sniff out pythons, which they did successfully during a brief trial in the Glades. If you are wondering if the Burmese python could become a threat to northeast Florida, that appears unlikely because the snakes do not survive cold temperatures. Scientific experiments with two different groups of pythons, one in Gainesville, and another in Aiken, S.C., resulted in the snakes dying during cold weather. Wildlife experts believe the winter cold snap of 2010 destroyed about half the Burmese python population, far exceeding any human effort at eradication. For now at least, it appears the snakes remain a South Florida problem. Until next Saturday, be well and take at least one step to give nature a hand. To begin with I have owned various species of snakes my entire life, I absolutely in no way agree that these snakes should be let loose or even owned for that matter. I do have one point though, that has bugged me for years. I completely understand the problem and turmoil these invasive creatures are causing in our ecosystem and I agree they need to be either trapped and relocated or killed due to them killing our native wildlife. But for years I have wondered, these invasive creatures are getting so much spotlight in the news but they honestly don’t do anything more than a common house cat. I sit in my office at my home around 11 hours a day and I have 2 bird feeders in my yard and I watch while people’s common everyday cats stalk my native birds. I watch as they creep and hunt and kill squirrels in my own yard. So I ask you “Why put so much attention on the snakes when we have a much larger battle with our own common cats killing our native species”? If we’re going to even attempt to try to preserve our native wildlife then start with cats. And for all of you cat lovers out there let me say that I don’t hate cats I just think they should be properly taken care of INDOORS either declawed or not. I would normally pass on stories of snakes, snails and any other kind of “yuck” thing in the environment!! BUT Frank you are the KING at getting a reader like me to know and understand and YES enjoy your articles!!! The information you pass on is “always” so enlightening!! Your insight, knowledge and brilliant writing style overwhelms me at times! Thank you so much for all the information you pass on!! Keep up the GREAT work!! Regarding references made in this article to the ENP mammal decline study published in the Proceedings of the National Academy of Sciences, that paper fails to convincingly demonstrate two things 1) That significant mammal declines even are occurring in the Everglades, as it was based only on observations of mammals seen on or near roadways during the “systematic road surveys” and 2) that there is any causation at all linked to the presence of Burmese pythons to “severe mammal declines”. One should know that correlation simply does not equal causation in any reasoned scientific analysis of a problem, and it would seem just as likely, if not more so that numerous other factors-such as mercury pollution of water ways in and around ENP- would end up being far more responsible for any mammal declines than the presence of a species with a very slow metabolic rate struggling to survive after yearly cold spells in only two counties in the southern tip of Florida. Much of the media has played extremely fast and loose with the facts surrounding this issue, while misrepresenting the findings of this paper, and would have the public believe hordes of Burmese pythons are poised to swiftly colonize the southern third of the continental U.S. from California to Washington D.C. while eating every toddler and form of native wildlife in sight along the way. However, even one of the paper’s co authors, Frank Mazzotti, has published clarifications regarding this report by stating: “We were careful not to say “caused” because we don’t know that.” In my opinion, when even one of the co authors of a much hyped study feels the need to publish clarifications on a study, perhaps it is time for any and all responsible media outlets to pay heed and shift gears from chasing ratings and operating on histrionics to accurately reporting on facts and truth. In all my years born and raised in Florida, I never thought anything could take on a gator, but I saw a python swallow a 7 foot gator down in the glades a few years ago. This is one helluva snake. The main issue is that there aren’t enough people dedicated to removing these pythons. They can have up to 50 or more babies a year. If more people don’t spend time removing them, they’re just going to keep breeding. The snakes eat smaller gators. They keep each other’s population in check. That being said, are they REALLY a problem? Not in my opinion. They aren’t a native species, but they aren’t truly harming the ecosystem. Frank Gromling is my favorite contributor on Flaglerlive. ‘We’re going to need a bigger boat’ for the Glades. If you own one of these snakes, eventually you must start feeding it live food. The snakes “graduate” from eating dead mice specifically bred as “snake food” to live rabbits that have to be dropped into the cage. And if you are too cheap to regularly feed your pet snake, better have a strong lit on the cage and no small child in the house. There have been cases where the sleeping child was suffocated by a hungry snake that got out of its cage. The most recent case was in Palatka. That seems to be the major difference between this invasive species and cats – it can kill humans if not properly cared for. Actually anyone responsible to cares for these animals will never ‘upgrade’ to live feeding, there are many places that supply pre-killed rabbits for these large snakes. I agree, these animals are not for the everyday reptile owner, they get too large to safely handle with our a standby and can hurt someone. I have reptiles, snakes included, but I wouldn’t get something that I couldn’t safely handle by myself. That being said, you should investigate before claiming that all adult burms and retics only eat live because there are a lot of people out there who feed their large snakes frozen/thawed rabbits. hAve you ever tried to remove feral cats from an abandoned house? Yes they can kill you. But really, these snakes live in indonesia and there arent any reports of them going after kids for centuries. You can feed frozen/thawed prey to a serpent from the day its born to the day it dies 20 years later. And the Palatka case doesnt make sense and can you please link all these other cases of snakes getting out and constricting children? It is not true that you eventually start feeding live animals. It is very common practive and by far the norm to continue to feed these animals humanely euthanized feeder animals well through adult feeding. SOME people do feed live animals, but it is not the norm and it is frowned upon by the community at large. @ Justice for All…Just so you know for future reference, my friend owned a 18 foot reticulated python and never once fed live food. Live food only injures your pet snake. I’ve also owned a 5 and 1/2 foot Red Tailed Colombian Boa, a 3 foot Ball Python among others and I also NEVER fed live food to any of them. There are no substantial gains to be won from feeding live food to your pet snake. Live rats, or rabbits will tend to gnaw and bite at your snake causing alot of damage even death. Also, if you feed live food you unknowingly make your snake more aggressive by bringing out their predatory instinct. If your going to own one of these you need to be mature in knowing what your doing with reptiles if not they can kill. Of course then again Pit Bulls kill everyday, instinctually and we don’t hunt them down. One more thing I must add is that even though Burmese Pythons seem to be on top of this countries “hit list” they are now an endangered species in their native country. It’s sad to see so many animals hunted and killed. Most keepers will point blank refuse to feed live due to a number of reasons. As Correct Your Facts pointed out the prey items are humanely euthanized and then frozen, only to be thawed out and warmed up prior to “dinner time”. There are snakes that are picky eaters and will only eat live food, however many keepers celebrate the day when their snakes “graduate” from live food to frozen food for numerous reasons. In addition many keepers (regrettably not all as evidenced by the stories about people, mostly children, being bitten by escaped pet snakes) feel that regardless if you have a well fed snake or not, a properly secured enclosure is essential to keeping these animals. Many of these snakes cost several hundred, if not thousands, of dollars and the LAST thing we want is an escaped snake. Is the invasive Burmese python population in the everglades a problem? Yes, and myself and many other keepers agree that its a shame that it happened in the first place and are fully in support of removing them from southern Florida. But that does not mean that our politicians should prevent people from taking their pet snake with them as they cross state lines. These exotic imported animals discarded by their overwhelmed owners or escaped from their zoo enclosures on hurricanes or other disasters, are a threat to humans and local wildlife and domestic animals. They have to be eradicated…and strict controls like microchips and yearly license renewal with a proven possession of the animal visual affidavit, need to be enforced. Otherwise if too costly, plain ban should be the law. I do not agree either that cats should roam free evrywhere killing our backyard birds. Did anybody even read the artcle & notice that it is stated they are NOT finding as many as they thought. And the “fact” that they don’t know where they came from? DNA tracing HAS linked them back to the breeding facilities that were destoyed in the hurricanes! The media needs to publish the truth instead of trying to feed on peoples fear to get ratings which equal dollars. They are trying to bust down a multibillion industry that does have millions of responsible people in it. No, reptiles should not be in every household, but I wouldn’t want a dog in mine. I enjoy my iguanas & other reptiles (including snakes) and would never think of releasing into the wild. In fact I feel so strongly that captive bred (domesticated) animals should never be released that we now operate a reptile sanctuary for those animals that somebody else may not be able to keep for some reason. There is a reason snakes like that have been around for millions of years. They are resilient. oh dang,these are the killers.its for the best to bring them all to a safe place where they cant hurt anyone.